Cranberry sauce is like whipped cream. Whenever I make whipped cream from scratch, I get all sorts of impressed expressions like, "Wow! Real whipped cream!" or "I wish I had the time to do stuff like that!". I'm always torn between the prideful part of me that wants to look awesomely domestic and the side of me that is ever-eager to dispense any sort of knowledge (hence this blog). Usually I'll come clean and tell people how incredibly easy it was to make and how it only took a few minutes. The same goes for cranberry sauce. People think it's fancy when you make your own, but, really, it's a cinch to make; it only takes around ten minutes hands-on time. I know that for some people (like my dad) Thanksgiving isn't quite Thanksgiving unless the cranberry sauce belches out of a can and has lines imprinted on it. To each his own. That said, the canned stuff does have high fructose corn syrup in it and I'm all for avoiding that stuff completely. And, as it is with most homemade foods, the from-scratch version tastes so much better than the canned kind. 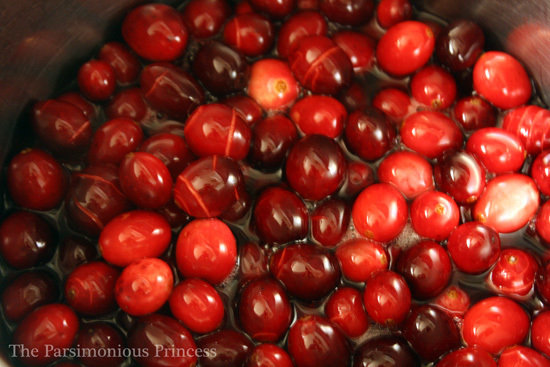 There are a bunch of different recipes for homemade cranberry sauce (some use orange juice, some have sugar, some have maple syrup, some have oranges or pineapple added to it), but the recipe I'm sharing with you is a basic, whole-berry cranberry sauce. 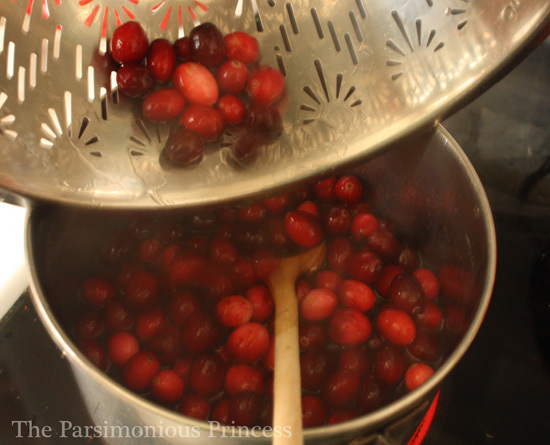 Rinse the cranberries in a colander. 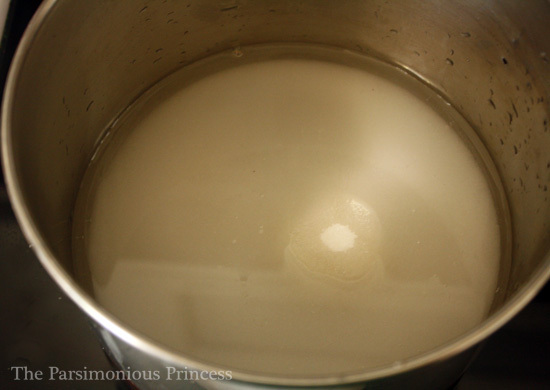 In a medium saucepan, combine the water and the sugar. Bring to a boil. 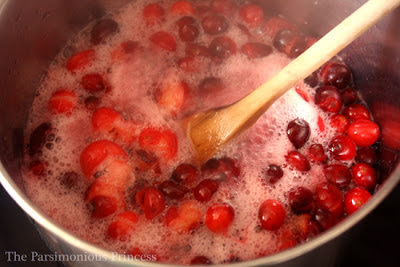 Once the sugar-water mixture is boiling, add the cranberries. Reduce the heat to medium-low. Stir occasionally. I can't quite explain why, but I like to watch the cranberries start to split (they get these fun lines and designs on them) and then pop. Yes, I am easily entertained. Let the mixture boil gently for about ten minutes. By then, the cranberries have all burst and have broken down nicely. 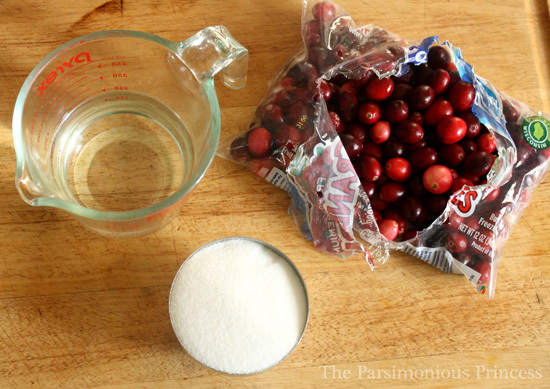 Pour the cranberry sauce into a bowl, cover, and let it cool completely at room temperature. Don't worry if the sauce looks kind of soupy at this point -- as it cools, it will reduce and get firmer. 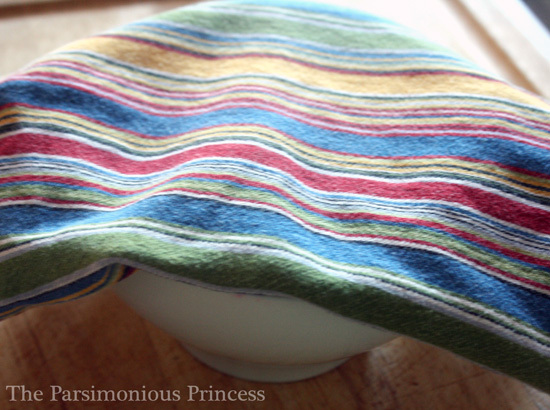 It reminds me of jam -- as it cools it begins to set. Once it has cooled, refrigerate the sauce until you're ready to serve it. Your family and friends will appreciate and admire your efforts. It's up to you whether or not you tell them how easy it was. 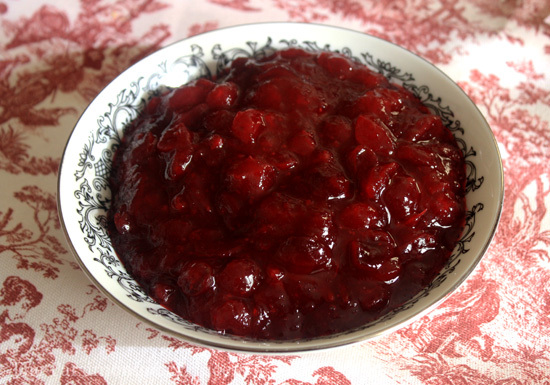 The first time I ever had real cranberry sauce was the first year I went to my husband's family's Thanksgiving. 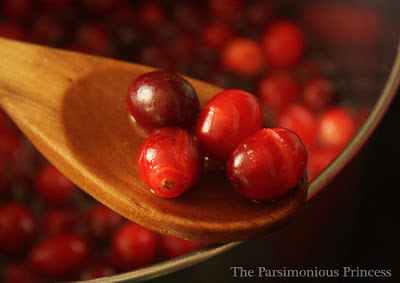 I thought I hated cranberries until I tried it. So glad I tried it, I love cranberries! Now we joke about how we have cranberry sauce with his family, and "canberry sauce" with mine.